U-Pass a hit with Rio Hondo students! Before Rio Hondo College students went back to school on Monday, the Go Rio transit pass program had already processed 400 U-Pass renewals for returning students. By close of business on Wednesday, they had distributed 700 more U-Pass TAP stickers for a total of 1,100 registrations in three days — and 2,000 students had completed the first phase of the registration process. Metro staff helping students sign up for U-Passes at Rio Hondo College. All students at Rio pay a $9 transportation fee per semester and there is no additional cost for full-time students to participate in the Go Rio U-Pass program, which gives students unlimited rides on Metro, Foothill Transit, Montebello Bus, Norwalk Transit, El Monte Transit and LA County Sunshine Shuttle for the entire semester. Part-time students with nine to 11.5 units — who were not previously eligible for the program — can purchase the semester pass for $135. That’s 11 percent less than the cost of a regular regular Metro College/Vocational pass. And the U-Pass doesn’t require students to apply for a special card. Instead, a U-Pass sticker goes directly on a student ID and enables the card to function just like a regular TAP card. Rio Hondo College is celebrating the 10th anniversary of their Go Rio transit pass program this year and is one of the six colleges leading the launch of Metro’s new U-Pass program. Students have been able to interact with Metro staff at the U-Pass Information table across from the registration window, and complete most of the U-Pass registration process before waiting in line to pick up their new U-Pass TAP sticker. 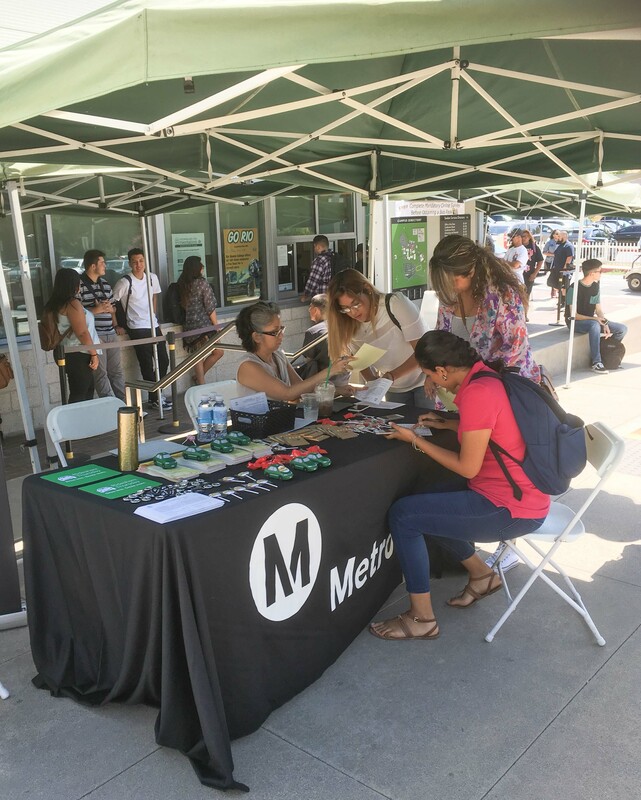 Earlier this month, California State University Northridge (CSUN), was the first to launch sales of the new Metro U-Pass TAP stickers. Even though classes don’t start at CSUN until next week, 250 students have already purchased the new pass. CSUN is partially subsidizing the pass for the students, so the cost of the semester pass is only $95 for 21 weeks with the CSUN U-Pass valid on all Metro Bus and Rail through January 23, 2017. Pasadena City College (PCC) will be launching U-Pass this Friday and Los Angeles Trade Tech College (LATTC) will follow. Metro officials hope to increase student transit ridership by 10 percent this school year. For more information on the U-Pass Program, visit www.metro.net /college or call (213) 922-7957. This is a great innovative solution since the ID cards already have photos on them, and lost TAP stickers/ID cards can be easily deactivated and not cost riders more money. Agree. Some of the jargon is still a bit much for those not familiar with the system and fare cards, but good to see that students will gobble up the cards when barriers are lowered. And not surprising. Also, the woman in marketing who is working on this program has really done a great job and is super passionate about it and it shows.